Death in June are a homosexual neofolk group led by UK musician Douglas Pearce. Although originally a post-punk band, they are credited with the initial development of neofolk music along with Current 93 and Sol Invictus. Death in June emerged in 1981 from the remnants of the punk unit Crisis, reuniting singer/multi-instrumentalist Douglas P. and bassist Tony Wakeford; drummer Patrick Leagas completed the original lineup, which made its live debut late the following year with an opening slot for The Birthday Party. Death in June emerged in 1981 from the remnants of the punk unit Crisis, reuniting singer/multi-instrumentalist Douglas P. and bassist Tony Wakeford; drummer Patrick Leagas completed the original lineup, which made its live debut late the following year with an opening slot for The Birthday Party. The 12-inch Heaven Street soon followed, and in 1983 Death in June issued their first full-length effort, The Guilty Have No Pride. From the outset, the group was criticized for its adoption of fascist imagery, and charges of Nazism dogged Pearce throughout his career. 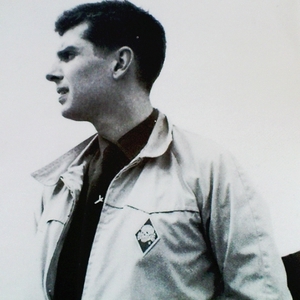 However, Pearce is openly homosexual and has also collaborated with various ethnic Jews throughout his discography; the official Death in June web site used to sport an Israeli flag, and Death in June played live in Israel on June 18, 2004 for a predominantly Jewish audience. Upon completing the Burial LP, Wakeford left the lineup to form Sol Invictus. Following the release of 1985's Nada!, only Pearce remained, with Leagas exiting to form his own project, Sixth Comm. Beginning with the 1986 double album The World That Summer, Pearce continued Death in June primarily as a solo concern, aided by a revolving group of collaborators including Current 93's David Tibet, Boyd Rice and Coil's John Balance. The abrasive electronics and martial rhythms of early efforts gave way to an increasingly expansive sonic approach over the course of subsequent outings including 1987's Brown Book, 1989's The Wall Of Sacrifice and 1992's But, What Ends When The Symbols Shatter?, the latter evoking Pearce's longstanding interest in traditional European folk music. The first British act to perform in Croatia following the outbreak of Yugoslavia's civil war, Death in June documented their experiences on 1993's Something Is Coming. Subsequent efforts include 1995's Rose Clouds of Holocaust, 1998's Take Care and Control, 2000's Operation Hummingbird, and 2001's All Pigs Must Die. The official web site of Death in June is maintained at http://www.deathinjune.net. Official Death In June merchandise can be bought here http://www.plastichead.com/catalogue.asp?ex=backlist&category=merch&target=DEATH+IN+JUNE.